Staples' James Frusciante controls the ball Monday against Brien McMahon. Frusciante led the Wreckers with 17 points Wednesday in a 79-58 loss at Bassick. Going into its final regular season game, the Staples boys basketball team's chance of making FCIACs was very slim at best. All of its hopes vanished Wednesday in a 79-58 loss at Bassick. Bassick raised its record to 15-5, 13-5 in the FCIAC, clinching the fourth-seed in the league playoffs. Staples dropped to 9-11, 8-10. "We lost to a very good team, who can play with anyone in the league," Wreckers coach Colin Devine said. Even if Staples won, it would have fallen short of FCIACs because Bridgeport Central and Danbury won Wednesday. However, the Wreckers would have finished 10-10, and have a better seed in the Class LL tournament. Staples kept it close with the Lions in the first half. Bassick led 19-17 after the first quarter and 39-35 at the half. "We were able to break their press, and take advantage of our opportunities," Devine said. The Lions came out roaring in the third quarter, and established a stranglehold on the game. Bassick displayed its athleticism and superior talent, outscoring the Wreckers, 24-10 in the third quarter, and extended their lead to a comfortable 18 points, 63-45, after three quarters. "They picked up the speed, and pace of the game, and we missed a few shots," Devine said. 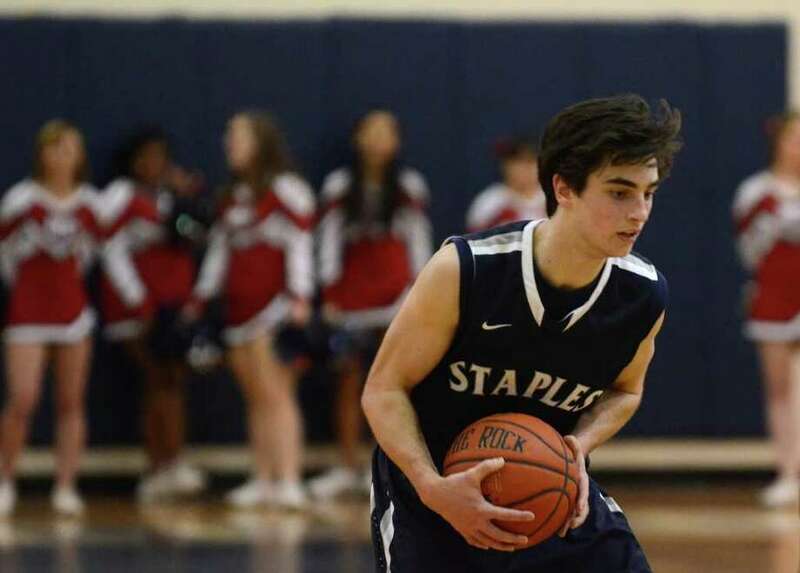 Junior James Frusciante was Staples' leading scorer with 17 points. Frusciante made a few layups, and was 7-for-10 from the free throw line. He also had four rebounds, four assists and two steals. Senior captain Mike Argosh (14 points) and junior Pete Rankowitz (11) also scored in double figures for the Wreckers. Argosh hit three 3-pointers, and led the team in rebounds with six. Rankowitz (four rebounds, one assist, two steals) hit a trey, and contributed on the glass and on defense. Also scoring for Staples were seniors Patrick Kohlmann (five), Mike Garrity (three) and Vasili Tziolis (two), junior Ross Whalen (four) and sophomore Darryle Wiggins (two). Kohlmann (three rebounds, one blocked shot, one assist) and Garrity (one assist) each hit a 3-pointer. Tziolis (three rebounds, two assists, one steal) played a solid game. Whalen (five rebounds, three assists, one steal) and Wiggins (three rebounds, one assist) battled on the glass. Senior Isak Hrvacic grabbed two rebounds. Junior Alex Addessi and sophomore Nick Ward had one rebound apiece. Junior Devin Coleman led the Lions with 18 points. Seniors Jerond Rogers (15) and Pashien Young (14), and junior Demetrius Thomas (10) all scored in double figures for Bassick. Although the Wreckers lost, and missed the FCIAC playoffs, their season isn't over. Staples qualified for the Class LL playoffs, and it will officially find out its seeding next Wednesday. "We have to keep responding, and keep preparing for our state tournament game," Devine said.